French children know all about ‘pâte à sel’. It is an excellent activity for anyone, and the recipe is easy. Put aside the play dough or plasticine for a while, introduce children to ‘pâte à sel’, and enjoy the wonderful creations. Creations made out of pâte à sel will last for years. Mix the salt and flour together first, then slowly add the water and work to a smooth workable paste. If it is too sticky add a little more flour and salt which you should mix together first. 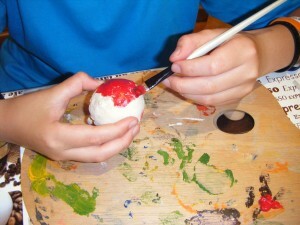 Be as inventive as you wish in your design, choice of materials, implements, food colouring etc.. If you want to dangle your creation, make a hole in it before you cook it, and don’t make it too heavy. Very slow oven (100 degrees) for several hours. Turn the models over during cooking and make sure they are thoroughly dried out on both sides. Give the finished models 1-2 coats of wood varnish to preserve them. And finally, leave the varnish to dry for 24 hours. Numbers are a fun, easy thing to start with. Children like making the number for their age and then decorating it with a few tiny flowers and shapes. In the video below you will see an angry bird being made!